You are here: HomenextPeoplenextPlayer ProfilesnextBoughton, Hubert James "Jimmy"
Hubert James Boughton, commonly known as “Jimmy” in Gloucester sporting circles, was born in 1859 at Westbury-on Severn, the son of John Boughton, a farmer and landed proprietor of Adsett Court, Westbury-on-Severn. His elder brothers, John and William A Boughton, were founder members of the Gloucester Football Club, and played in the first matches of the newly formed club in 1873. The first 2 matches were away and home to the King’s School, Gloucester, where Jimmy, aged 14, was then a pupil. Unfortunately there is no record of individual players in the school team, so we do not know if Jimmy played in those matches against his brothers. However, on leaving school he was soon playing for the club, and was articled to the law firm of Messrs Bretherton and Sons, where he qualified as a solicitor and became managing clerk to the firm. Jimmy’s first recorded game for the Club was on 17th November 1875, a 0-0 draw at Ross-on-Wye, but team sheets are not available for all matches in the early years of the Club, so he may have played before this. However, we know he played in at least 3 games in the 1875-76 season. In the first match of the following season, he scored his first recorded try against Stroud on 21st October 1876, and Gloucester won by a goal and a try to nil. In December 1876, he scored a try and kicked 2 conversions as Gloucester won by 2 goals and a try to one goal at Ross-on-Wye. He regularly played alongside his brother, William, although Jimmy played at half-back or three-quarter, whilst William was a forward; by this time, William was also on the Club Committee. By 1877-78, Jimmy was a first choice in team selection, and appeared in at least 14 of Gloucester’s 15 fixtures, as many as any other player (the team is not known for one match, but the team sheets are complete for subsequent seasons). He ended the season with 8 tries, which made him the Club’s leading try-scorer; he also took the kicks at goal, and converted 19 tries. He scored a try and kicked 8 conversions at Worcester in November 1877 – his brother, William, scored a hattrick of tries – as Gloucester won by 8 goals and 4 tries to nil. In the following match, Jimmy himself scored a hattrick of tries and kicked two conversions as Stroud were beaten by 2 goals and 2 tries to nil. In February he scored a try, 2 conversions and a dropped gaol as Handsworth were seen off by 2 goals and a dropped goal to nil. In 1878, Jimmy went onto the Club Committee as Treasurer, but his playing days were far from over – indeed he was the only player to appear in all 15 of the Club’s fixtures in 1878-79, and this did not stop him turning out for the 2nd XV as well when they played midweek. Again he started the season well with 2 tries (and one for his brother, William) and a conversion in the first match, a win over Cheltenham White Cross by one goal and 5 tries to nil, and ended the season with a total of 7 tries and 21 conversions. On 7th December 1878, he played in Gloucester’s first match against one of the big Welsh clubs, a 0-0 draw at Newport. On 30th January 1879, he kicked 4 conversions under floodlights at the Spa, when Gloucester defeated Rockleaze of Bristol by 4 goals and 4 tries to nil; a large crowd turned up, but the floodlights did not illuminate the ground well, and in the gloom, many shrubs in the park were trampled down in the prevailing gloom, and the Club was suspended from using the Spa for several months. Jimmy played a prominent part in persuading the Council to reinstate rugby before the start of the next season, but Gloucester were not to host another floodlit match until 1967 – a gap of 88 years. 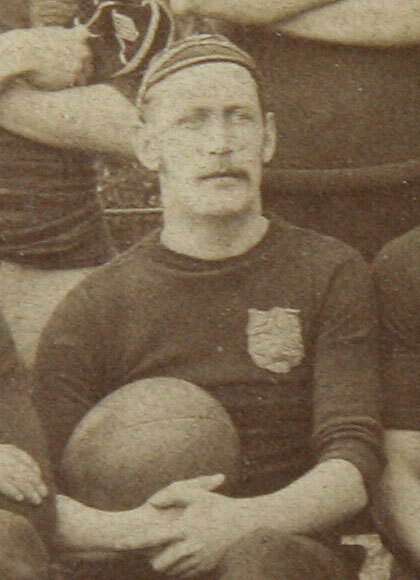 Jimmy played in 9 of 16 fixtures in 1879-80, and contributed 2 tries and 5 conversions in the slaughter of Rockleaze by 6 goals and 8 tries to nil, but also played in a few second team games as well. However, he played in only 2 games towards the end of the 1880-81 season, although he did score in both, including a brace of tries against Swindon. In 1881-82, he was back to regular first team rugby, playing in 15 of the Club’s 19 fixtures, scoring 5 tries and 6 conversions (handing over most of the kicking duties to H J Berry). Three of the tries came in Gloucester’s first match against Cheltenham at the Spa on 21st January 1882, and for good measure Jimmy added a dropped goal as well in the win by 2 goals and 4 tries to nil. During this season he also turned out regularly for the second team, many of their matches being played on Thursdays – he played at least 8 games for them. 1882-83 saw Jimmy miss only one of the Club’s 14 fixtures, and his ten tries were the most he ever scored in a season. They contributed hugely to Gloucester enjoying the only unbeaten season in their history, with 11 wins and 3 draws, scores for 16 goals and 34 tries and against 1 goal and 5 tries; the team were christened “The Invincibles”. Perhaps the highlight of the season was the defeat of Cardiff by 1 goal and 6 tries to nil. As well as playing regularly for the first team, Jimmy also took on the captaincy of the second team, and scored heavily for them. Jimmy Boughton stepped up to the captaincy of the first team in 1883-84, taking over from Frank Brown, who had led the team for four successful seasons during which they had transformed into one of the strongest in the country. Jimmy kept up the good work, leading the team to 15 wins, 2 losses and 2 draws, scoring 21 goals and 59 tries against 2 goals and 3 tries. The highlights were winning at Bath by 5 goals and 12 tries to nil (Jimmy scoring 2 tries and kicking 2 conversions); and beating Swansea and Cardiff, and drawing with Newport. Jimmy scored a hattrick of tries against Swindon Rangers, and ended the season with 7 tries, 3 conversions and 2 dropped goals. Jimmy continued as captain for the 1884-85 season, but was able to play in only 7 of the 20 fixtures, contributing 4 tries and 1 conversion; the team record was 11 wins, 7 losses and 2 draws. At the end of the season, Jimmy stood down as captain, and played only two more games for the first team; his final appearance was at the Spa on 13th February 1886 against RedlandPark. He finished his career with 105 matches, 51 tries, 73 conversions and 5 dropped goals. Jimmy was far more than a gifted rugby player – he became involved as player and administrator for many sports clubs in the City, and was later referred to as “the father of sport in the City”. However, his principle loves were football (as rugby was then known) and cricket. He was not only captain of Gloucester rugby but also captain of the Gloucester cricket club. He was keen to promote sport in any context – for example, in 1886, he played rugby for the Conservatives against the Liberals. When he gave up playing, Jimmy expanded his role in encouraging $older and organising sport in Gloucester. In 1891, Rowland Hill, Secretary of the RFU, commented on the upward-looking and supportive relationship that officials of the club, notably H J Boughton, had with the RFU. Jimmy became the first president of Gloucester Rugby club in 1892, but resigned in 1896 in order to avoid a conflict of interest with his duties at county level. He was also central to the organisation of rugby at county level – in 1878, the Gloucester County Football Club was formed by members of the Gloucester club, led by Jimmy, and he became the first Chairman. When this was superseded by the County Union in 1890, Jimmy was unanimously elected as the first President, and was re-elected every year until 1900, when he resigned and again became President of the Gloucester club. In 1897, he also became the first county representative on the RFU committee, a position he retained up to the time of his death in 1902. He had firm views on rugby being played in the right spirit, and went on record as believing that “to play for the love of the game should be the desire of every footballer”. He stood against rough play, ill temper and partisanship, and therefore opposed the creation of a Cup Competition believing that it would encourage these undesirable traits. He reported to the 1889 AGM of the club on attempts to procure their own ground, presenting various options, although none were then thought to be affordable. Later in 1889, he identified a possible site at Kingsholm, but it too was regarded as prohibitively expensive at an estimated cost of £4,000. On 1st January 1891, following the death of Mr Bretherton senior, Jimmy became a partner in the firm of solicitors, which henceforward carried on business as Bretherton and Boughton. In March 1891, he persuaded Hatton, a local brewer and a fellow Freemason, to buy the Castle Grim estate. In May 1891, he engaged in a public exchange of letters with A W Vears about the need to find the rugby club a separate ground away from the Spa (although he did not advertise that this was well in hand). He was instrumental in setting up the Gloucester Football and Athletic Ground Co Ltd, which then purchased the Kingsholm ground from Hatton (who made a tidy profit). Jimmy bought 100 shares in the company – this stake facilitated his appointment as one of the first directors of the company, and he also acted as solicitor for the company. His influence was probably crucial in Gloucester being awarded an international match, when England played Wales at Kingsholm in 1900. He encouraged the expansion of local rugby clubs in Gloucester, and likewise in cricket, was involved in the formation of the Gloucester Cricket League. He was a talented cricketer, both as batsman and as lob bowler. He was just as influential as captain and administrator for the Gloucester and county cricket clubs as he was for their rugby equivalents. He played for Gloucestershire alongside W G Grace, and scored 48 in his last match for the county second team in 1898. He served on the county committee, and was instrumental in establishing the annual match at the Spa, and in 1902, the year of his death, in expanding this to a full week with 2 county matches played in Gloucester, a legacy which was to last for well over a century. We greatly regret having to announce the death of Mr. Hubert James Boughton, of Lewisham House, London-road, Gloucester, which occurred suddenly at his residence shortly after six o’clock on Wednesday evening. Mr. Boughton had spent a very busy afternoon attending a business meeting in connection with one of his client’s affairs, and also a property sale afterwards. He returned to his office in King-street, where he had a few moments’ conversation with his partner, Mr. F. H. Bretherton, and then left for home in the best of spirits. Arriving at the house he entered by the door of the passage leading up to the side door. When just at the door Mr. Boughton was seized with a violent fit of coughing – he had been suffering from whooping cough for some time – and Mrs. Boughton, who had heard him cough from inside the house, went to the side door to meet him, where she found he had fallen down and was being attended by a passer-by and by one of the servants. Mr. Boughton was picked up and put into a chair, but he was dead almost immediately, having apparently fallen down owing to failure of the heart’s action following the excessive strain caused by the coughing. Dr. Ancrum was at once telephoned for, and was at the house within a few minutes, and he is satisfied that death was caused by heart failure, as quite recently he medically examined Mr. Boughton and found him organically sound. The greatest sympathy is felt for Mrs. Boughton. It is difficult for her to realise the loss she has sustained, and the shock has completely unnerved her. Hubert Boughton married Kate, eldest surviving daughter of Mr. T. H. Chance, and they have had together thirteen years of happy married life. There are two children, a boy and a girl. Hubert Boughton had a delightful, sunny disposition, and he was incapable of doing or saying anything that might have caused the slightest pain or injury to anyone, whether his personal friends or slightest acquaintances. His friendship was valued by all who knew his excellent qualities of mind and heart, and few men in the city were better or more widely known, and none were more greatly esteemed. Mr. Boughton, who was 43 years of age, was a son of the late Mr. John Boughton of Adsett Court, Westbury-on-Severn. He was educated at the King’s School, Gloucester, and was articled to the firm of Messrs. Bretherton and Son, solicitors, and on qualifying as a solicitor became managing clerk to the firm. On the 1st January 1891 – after the death of Mr. Bretherton, sen. – he became a partner in the firm, which henceforward carried on business as Bretherton and Boughton. Amongst other offices he held were those of solicitor to the Gloucester Conservative Benefit Society, and also solicitor, as a member of the firm, to the Gloucester Football and Athletic Ground Company Limited. Hubert Boughton was a member of the Royal Gloucestershire Lodge of Free Masons, and held the office of Junior Warden. He also belonged to the Royal Arch Chapter of Freemasons, and he was also a Mark Mason. The sad news of Mr. Boughton’s sudden demise came as a great shock to all circles in Gloucester, and to none more than the sport-loving community. Few could realise that the popular “Jimmy” would not be seen again on the playing fields of Gloucester. For something like 25 years deceased had been closely identified with all branches of athletics, and was regarded as “the father of sport” in the city. Football and cricket were his chief delights, and what he has done for the advancement of these great national pastimes in Gloucester and the neighbourhood can never be fully estimated. His sudden death creates a gap which will be exceedingly difficult to fill, and it takes from us one of the most genial and best of sportsmen. To detail Mr. Boughton’s connection with local athletics is a task of some magnitude, but it would be impossible to over-estimate his services. Back in the eighties he was a football player of marked ability, and after his retirement from active participation in the game he gave both the city and county clubs the full benefit of his wide knowledge and ripe experience. When the CountyUnion was established on a more popular basis in 1890, Mr. Boughton was unanimously elected the first president, and the fact that he was re-elected without opposition each succeeding year up to 1900, when he resigned and was succeeded by Mr. F. N. Cowlin, is evidence in itself of the high esteem in which his services were held. His fitness for the important position could not be questioned, and for a long period it was a matter of deep regret that he was not a member of the English Rugby Union Committee. In 1890, upon a re-adjustment of the basis of representation upon the committee of the English Union, that defect was remedied, and he had the honour of being the first representative of Gloucestershire sent direct to that important body, and he held the post up to the time of his sudden death. Great as were his labours on behalf of the county, he was of even greater service to the Gloucester Club, of which organisation he resumed the presidency in 1900. He captained the team in seasons 1883-4 and 1884-5, and maintained active interest in the Club right up to the time of his death. When the Football Club were called upon to leave the Spa Ground deceased lent his valuable aid in the procuring of the Kingsholm enclosure, and was one of the first directors of the Company. Keen as was his interest in Football, he was in almost an equal measure devoted to cricket. For many years he was he was a member of the committee of the County Club, and it was owing to his personal interest that the annual match played by Gloucestershire on the Spa Ground became such a popular fixture, that this year arrangements were for the first time completed by which the city is to have a full week’s cricket, receiving visits from Surrey and Somerset. Mr. Boughton was also a practical exponent of the game, and on several occasions he represented the county, though he never met with a measure of success corresponding to his real ability. His last appearance was for the Gloucestershire second team, against Wiltshire, at the CountyGround, in 1898, when he scored 48. As captain of the Gloucester City Club he did much to make organisation one of the most prominent in the county. A batsman of no mean merit, he rarely failed to make runs; while his lob bowling was often found extremely useful. In order to encourage local clubs, Mr. Boughton assisted in the formation of the Gloucester Cricket League, and he cherished great hopes of this new scheme doing much good. During the last two or three years Mr. Boughton had taken up golf, and deceased proved himself no mean player. On the occasion of his marriage in 1889, Mr. Boughton was presented with a handsome black marble clock, with hunting watch face and ornaments, silver tea and coffee service, and entrée dishes, “in recognition of his long and valuable services in connection with the various athletic clubs of the city and county of Gloucester.” The subscribers numbered 209,and their names were engraved in a leather-bound book, on the cover of which was a silver shield bearing the recipient’s monogram. In the course of his reply, Mr. Boughton mentioned that just nine years previously he was entertained and presented by the Cricket and Football Clubs of Gloucester with a silver cup and pencil-case on the occasion of his leaving the city for a temporary residence of twelve months in London. The funeral will take place at 2.30 on Saturday afternoon at Barnwood. The arrangements have been placed in the hands of Messrs. Herbert and Sons, Northgate. I’m a Boughton by birth. My father was Harold John Boughton, played and captained Gloucester rugby football club and played for England and captained them 3 times. I’m not sure but I think Jimmy was a relative of mine – does anyone know? If so please let me know – thank you in advance. Thanks for your query, Gerald, which we’ve answered in an e-mail to you. It prompted us to do a bit more digging and as a result we can refine the above Player Profile.